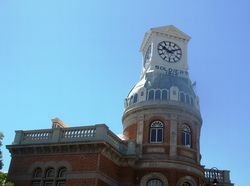 The Midland Town Hall clock commemorates those who enlisted from the district, and those who died in service or were killed in action in World War One. 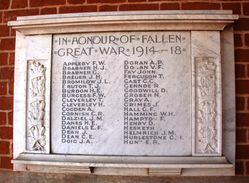 Three marble plaques are located in the entry porch to the clock tower area and four honour boards are displayed on either side of the stage in the auditorium. 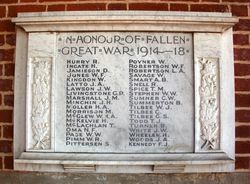 Two of the marble plaques list the names of those who died in World War One, the names are inscribed in black and ornate carvings run down both sides of each of the plaques. The third plaque is long and rectangular in shape with inscriptions also in black. 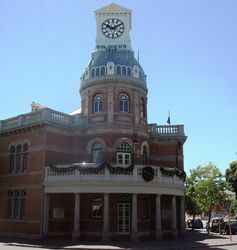 The Memorial Clock erected in the dome of the Midland Junction Town Hall was unveiled by the Governor of Western Australia, Sir Francis Newdegate on the 18th November 1923. The Governor and Lady Newdegate were met by a guard of honour under Captain Hugo Throssell V.C. The West Australian (Perth), 19th November 1923. In honour of those who fell in the Great War.